Today's readings recall how Christ is the One the Jews waited for. He is the the completion of God's plan to save humanity. They remind us of faith. In the first reading from Genesis 12:1-4, we read how God speaks to Abram and tells him to leave his past to a new land. He will become the 'Father' of a new nation. The first reading reminds us how it all started. God made a covenant with Abram who would later be called Abraham. He would be the model of true faith for all and God would found a nation which he would be the father of. God calls Abram to leave all behind. This is not easy to do. Imagine listening to a disembodied voice telling you to leave your family's land and go to a strange land which the voice promises will be yours. Abram trusted God. He never questioned God's commands. and all his works are trustworthy." We recall how God is trustworthy. Like Abram, we are called to leave all behind and trust God because God is God and does not deceive. The second reading is from the Letter of St. Paul to Timothy and speaks of how God's grace brings us to holiness. It starts out by telling us that our faith is not easy and is full of hardships. However, God gives us the strength to carry on. Again, this reading reminds us of trusting God. God has everything under control despite our lives getting hectic at times especially when we get closer to God. It is God's grace that keeps us going, not our own. 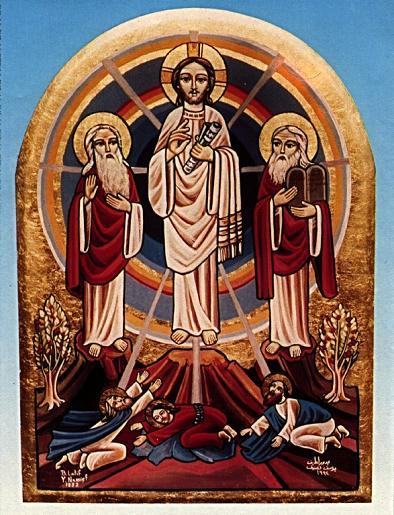 Lastly, the Gospel is the story of the Transfiguration where Christ takes Peter, James and John to a mountain top and He visibly transforms into a glorious being glowing in God's glory. Moses and Elijah, two pillars of the Jewish faith appear beside Christ representing Israel, the law and the prophets while validating that Christ is the one they were preparing the Hebrews for. This transformation is a foreshadowing of the Resurrection where Christ will appear in a glorious form after He rises from the dead. Again, the Gospel shows how Peter, James and John trusted Christ and followed Him. They were the first to be called and were His closest disciples. We as followers of Christ must reflect on this during Lent and throughout the year. We must analyze where our faith lies. We must ask ourselves how much do we trust God? Are we willing to give up everything for God? Are we willing to go wherever God calls us to even if it brings us pain and suffering? This is why we do penance, abstain from meat, and fast. This is why we give up something for Lent and offer more so we can discipline ourselves. Detachment is the key to getting closer to God. St. Francis of Assisi and other saints have showed us that only in casting away our worries, our material desires do we grow closer to God. God afflicts the comfortable and comforts the afflicted. Our trials make sense only in faith. Let us continue to grow in faith, trust God and focus on His Son Jesus who is the only One we need. R/ (22) Lord, let your mercy be on us, as we place our trust in you. R/ Lord, let your mercy be on us, as we place our trust in you.